(Nanowerk News) Computers, tablets and mobile phones are all popular consumer products. The lifespan of these devices is usually short, between two to four years. Shakila Umair, researcher at KTH, travelled to Pakistan to see how these common electronic devices are dismantled and recycled. She investigated the harsh living conditions of people working with e-waste ("Social Life Cycle Inventory and Impact Assessment of Informal recycling of Electronic ICT Waste in Pakistan"); Conference paper to be presented at the First International ICT for Sustainability Conference (ICT4S), Zurich, 14-16 February 2013). Shakila Umair, researcher at KTH Centre for Sustainable Communications, made two field trips to Pakistan to study how e-waste is actually taken care of. She conducted a “social life cycle assessment” (s-LCA) on the social impacts of informal e-waste recycling in Pakistan. “There are massive health and social problems connected to e-waste recycling in Pakistan. At the same time it is the only source of livelihood for thousands of people”, says Shakila Umair. 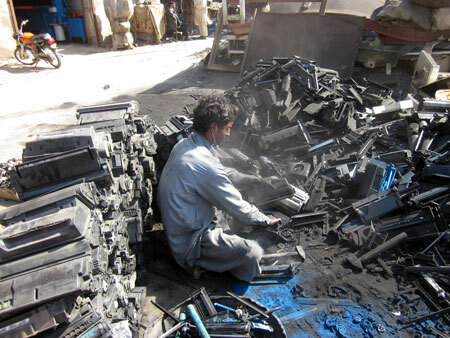 A man manually dismantling printers after which carcinogenic printer ink is left on the ground. The assessment showed that the informal processes have a number of negative social and environmental impacts. Workers manually dismantle old equipment, burn wires to get copper and dip old circuit boards in acid to extract precious metals such as gold and silver. They inhale toxic fumes every day and lack awareness of the health risks. “Relatively small protective measures such as gloves and masks would easily make a big difference on the workers’ health. But they cannot afford it themselves”, says Shakila Umair. Men, women and even children are working with e-waste up to twelve hours per day, six days a week, without social security or benefits. Their income is low, approximately 2.7 dollars per day. There are international regulations preventing the transfer of hazardous waste, such as e-waste from developed to less developed countries. But there are loopholes which result in a growing illegal trade in e-waste. About 80% of all e-waste is shipped to developing countries where poor people recycle it manually at much lower cost than if it were recycled in more developed countries. Recently, the regulations around e-waste have become stricter in both India and China. This means that more e-waste will end up in countries like Pakistan, Sri Lanka and Bangladesh with weaker legislation and authority control. Shakila Umair does not want to see a stop of e-waste treatment in Pakistan, since it is the livelihood for thousands of poor people. But e-waste treatment needs to be formalised, at least partially. What she asks for is that both local authorities and global ICT manufacturers take responsibility for the health and social situation of the workers in the informal e-waste economy. “Why not include the conditions of these 'distant workers' in the Corporate Social Responsibility policies of global ICT suppliers?” concludes Shakila Umair.